If you’re wondering why the energy bills in your commercial property are skyrocketing, it may be because it’s time to replace your business roof. If you have a hail damaged roof or an old roof, it could be allowing the outside elements to get inside the building. Below explore some of the ways your commercial roof is costing you hundreds or even thousands of dollars each year. Intelligent Design can take your old roof and replace it with a modern commercial roof that will protect your entire building. It’s not uncommon for property owners to think that their commercial roof will last forever. Roofs, however, take a beating from mother nature. When you consider the temperature outside, the wind, hail, storms, and UV rays and how they affect your roof, it doesn’t take long before it needs maintenance and care. Hiring Intelligent Design roofers could be just what you need to maintain the roof and keep your energy costs low. Something more costly than energy bills is structural repairs. Water leaks can cause severe damage to your building’s structure from the top down. If you have an older roof with cracks, holes, or other damage, both wind and rain will get inside and cause deterioration of the framework. Even if your building is made of steel, the metal can corrode over time. Structural repairs are expensive because you have to renovate walls, ceilings, electrical systems, and other components of the building. Our Minneapolis roofing company can inspect your building to see if we need to repair any parts of the structure. We may need to replace your old commercial roof if it costs you money. It may not be an expense you were not planning on, but it is a substantial investment in your building and your business’ future. A new roof will reduce your energy bills and your roof repairs. It will also stabilize both your building’s interior and exterior, as well as increase your building’s value. An old roof will only take away from your building, but a new roof will add to it. Intelligent Design can help you redesign and build your roof to bring new life into your building. 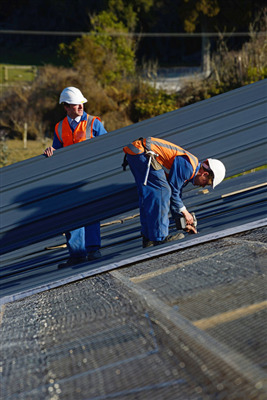 Don’t keep wasting money on your old commercial roof. Our Minneapolis roofing company can help you restore your building by replacing your current roof with a fresh new roof. We also provide other services such as ice dam removal and disaster reconstruction. To schedule an initial consultation, call us at 763-315-0745, or you can message us on our contact page. We provide roofing construction for commercial properties in Minneapolis and St. Paul, Minnesota. « Is it Possible for Winter Weather to Damage Your Roof? What Are the Most Vulnerable Areas of Your Commercial Roof?